Summary of previous deliberations: In approving the inscription of this site on the World Heritage List at its eighteenth session in 1994, the Committee recommended the Chinese authorities to extend the boundary to include Jokhang Temple and the surrounding historic quarters. This point was discussed at the twentieth extraordinary session of the Bureau in November 1996 and the Delegate of China informed the Bureau that the Chinese authorities were in favour of this extension as recommended by the Committee. A report was submitted to the World Heritage Centre by the State Bureau of Cultural Relics of China in July 1998, which indicated that the Government of the Tibetan Autonomous Region would be formally requesting the inclusion of Jokhang Temple within this site, and that the responsible Chinese authorities would proceed accordingly. On 18 August 1998, the World Heritage Centre requested the Director-General of the State Bureau of Cultural Relics of China to provide further information on the progress of the extension before 1 October 1998. No written correspondence has however been received by the Secretariat. To protect the setting of the site, modern residences and shops around the square in front of the Palace, which were not in harmony with the historical monuments, were removed by the local authority. The use of traditional building material and methods in the restoration work is being promoted so as to preserve the original architectural features of the site. Publications concerning the architectural styles, paintings, sculptures and the contents of all the cultural properties of the Potala Palace were prepared and distributed by the local authorities to raise awareness amongst the general public. The World Heritage Committee, at its twenty-second session held in December 1998, noted the Bureau’s request to the State Party again requested the Chinese authorities for information concerning the possible extension of this site. To date, no additional information has been received by the Secretariat. The Bureau may wish to examine further information that may be made available at the time of its session and take the appropriate decision thereupon. The Secretariat may briefly report to the Bureau the progress made in the extension of this property, if the nomination is submitted by 1 July 1999. 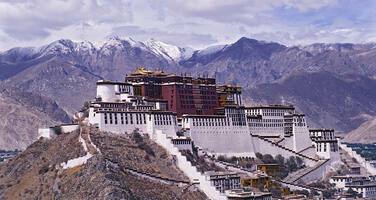 New information:In anticipation of the extension of the boundaries of the World Heritage site of the Potala Palace to include the Jokhang Temple and the Barkhor historic area, as requested by the State Party in July 1999 in response to the 1994 recommendation of the Committee, the national and local authorities have enhanced their efforts in the documentation and conservation of the monumental and urban heritage of the proposed extension area. Collaboration with international non-governmental organizations, international universities and local authorities linkage activities have been strengthened in these areas. The active participation of the Lhasa Municipality in the Suzhou International Conference for the Mayors of Historic Cities of China and the European Union (April 1998) organized by the Centre and the Ministry of Construction of China, and other activities within the framework of the Centre’s Special Programme for the Cities of Asia are noteworthy. A delegation from the Tibet Autonomous Region (TAR) visited Norway in October 1999 under the framework of the Tibet-Norway University Network Co-operation scheme to determine the next series of co-operation activities, some of which are proposed to be in association with the World Heritage Centre. The organization of a technical workshop with support from UNESCO and NIKU (Norwegian Conservation Institute), has been proposed to (1) review the Old Lhasa Historical Map, a Norwegian supported project carried out since 1996, and (2) to impart with recent mural painting conservation skills through an on-the-job training workshop to restore the paintings of Lukhang Temple of the Potala Palace. In view of continued incidents of illegal demolition and inappropriate reconstructions in the Barkhor historic area, mainly by private and business concerns, the Centre and the State Party are currently discussing measures to raise awareness and respect for conservation among the local population.